Clare Joyce spends an emotional evening with The Funding Network. On an unseasonably warm evening in Sydney, the doors of the elevator slide open onto the 25th floor of the AMP building. I collect my name badge and accept a glass of champagne. I catch glimpses of the Sydney Harbour Bridge as I make my way through the throng of people. The atmosphere is festive with a current of nervous anticipation. A little like the moments before a wedding or a grand final or a concert. Except we are not here to celebrate love, or barrack for our team, or scream for our favourite singer. We are here to help three women make the world a better place by pledging money to their causes: homelessness, refugee literacy and domestic violence. But before the pledges come the pitches. The three social entrepreneurs have six minutes each to tell us their stories and how the money we promise later in the evening will be used to help the people they help. I know they have received pitching coaching from The Funding Network, but they must feel nervous. I feel nervous for them. Lana Borg is indeed nervous, but she soon finds her rhythm. Some years ago, Lana and her husband Roger heard about an elderly gentleman living under the Nepean Bridge in Penrith in Sydney’s West. He was suffering from alcoholism and mental health issues. Lana and Roger tried to help him but he would only accept some food. I glance sideways and notice my sister wipe away a tear. I glance further along my row of seats to see more tears. Deep breaths, this is even more emotional than I expected. We learn that Mama Lana’s Community Foundation now helps up to 90 people a night men, women and children either homeless or struggling to make ends meet. And Lana and Roger’s dream is now a reality with the opening of a drop-in centre they have called The Little White House. “We want to create a place of acceptance without judgment for the often forgotten in the community. A place of belonging and respect and dignity,” says Lana. There’s only one thing still out of Mama Lana’s financial reach – a commercial convection oven costing $15,000. Right now, the 100 meals that Lana and her volunteers serve each night are made in their ovens. In their homes. After they have all done a full day’s work. If Lana could raise enough money, they will have more time to make a greater impact on the people they call their second family. “The one thing that Mama Lana’s has given us is the satisfaction of knowing that we are making a real difference to people’s lives. We are all capable of being able to make someone else’s life a little better – with no strings attached.” And then Lana turns with a smile to show us those same words on the back of her Mama Lana’s t-shirt. Next is Sister Diana Santleben from Zara’s House Refugee Women’s Centre in Newcastle. 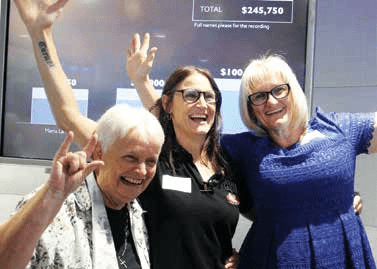 While helping refugees from Afghanistan, Iraq and Syria, Sister Diana and her colleagues discovered that after two years of studying English full time at TAFE, 80% of the women still considered themselves to have poor English skills. Further investigation revealed that most of the women had never attended school or learned to read and write in their own language. Fluency in a second language is hard enough after a certain age, but pretty much impossible if you are not literate in your mother tongue. With the help of refugee Habiba Mehraban, who taught Dari in Afghanistan, and who joins Sister Diana on stage, they began to devise a plan for a Mother Language Literacy Program. The first step was to download the kindergarten curriculum produced by the government of Afghanistan. “You can buy anything online. Anything!” quips Sister Diana, bringing levity to the evening. 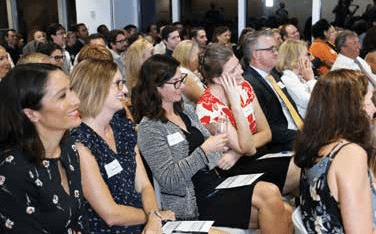 On a warm Sydney evening, 190 people gather for a crowdfunding evening they wouldn’t forget. Australian teaching accreditation; providing child-minding so the women are free to teach and study; buying Opal cards for all the women so they can take public transport to classes; developing teaching materials (currently they have hit a roadblock – in Australia there’s only one multilingual children’s picture book in English, Arabic and Dari); and the ultimate aim: to help the women gain Australian citizenship. I imagine those taught by nuns are laughing the loudest. Sister Diana needs $30,000 to implement the plan over the next two years. That’s $850 a week for 40 weeks for about 40 women. But that’s just for starters. “Do you know how many women die every week because of domestic violence in Australia?” asks Simone Patterson from The Sanctuary Women and Children’s Refuge. It’s one, Simone tells us. One woman dies every week in Australia because of domestic violence. The room is silent. Simone and her husband Nigel have a very personal reason for setting up the refuge. Simone grew up in Sydney in a home afflicted by extreme domestic violence. She describes her father as a very violent man who one night put an axe through the front door. “I don’t want another child to go through the childhood I had. I love my parents, but it was hell,” says Simone. I’ve barely had time to wipe my tears away when Simone divulges a fact that stuns me. I think of my five nephews aged between 12 and 17 and the lovely lives they live, but I barely have time to process this information when lightness returns. The other unique aspect of Simone’s refuge is that the women and children fleeing their homes can bring their pets. Simone laughs, the crowd laughs, Nigel gives a wry smile and raises his eyebrows. Simone describes the horrific injuries that women arrive with: broken necks with halo collars drilled into their heads, compressed cheekbones, fractured arms. Even the pets are sometimes as damaged as their owners, the broken tails and spinal injuries collateral damage of homes scarred by violence. “We see a really ugly side of life sometimes. They come in so broken and they leave different people. They are like swans that take off. And that’s what we want, that’s the yes moment when we know we’ve done our job … We want a place of healing and that’s what we are doing. We are healing and providing a place of safety and security,” says Simone. Soon the 190 people gathered here, with nowhere to hide their tears under the fluorescent lights, are going to help. Lana, Sister Diana, Simone and their supporters leave the room. An advocate for each organisation will give a short speech and make an initial pledge to get us a going. All you have to do is raise your hand and give a dollar amount and your name. There is a minimum pledge of $100 but no glass ceiling here, as we’ll soon find out. Even better, the AMP Foundation will match the pledges. There’s a slight pause before someone raises her hand for Mama Lana’s. And then the pledging quickly picks up pace. Hands go up across the room. $200. $500. $100. $1,000. $300. $100. $4,000. To my left a TFN employee is tapping away at a computer so we can watch the total rise before our eyes on a big screen. People gasp and clap when someone calls out a figure over $1,000. Those of us at the front may be craning our necks to see who it is but it doesn’t feel like a competition. It feels good, it feels intoxicating. Brothers, wives, employees pledge on the proviso that their sisters, husbands and bosses match their pledges. People get creative. “I pledge $200 if someone also educated by Catholic nuns pledges $200.” “I pledge $300 if someone not educated by Catholic nuns pledges.” The 13-year-old girl behind me, whose family has already pledged thousands of dollars, pledges $100 on behalf of her dog. My sister pledges if someone else with a boy over 12 will pledge too. There is a final flurry of pledges across all three organisations. Somewhere behind me a group of young men have been making significant pledges all evening but the final donation of the night brings the house done. “Let’s make it an even number,” says the man of the total pledges to The Sanctuary. He pledges $21,700. I cannot wait for Lana, Sister Diana and Simone to come back in. Sister Diana, Lana and Simone have very good reason to celebrate after the pledges wildly exceeded what they had hoped. One by one the total of each organisation is revealed. To Mama Lana’s Community Foundation, $70,750. To Zara’s House Refugee Women’s Centre, $75,000. To The Sanctuary Women and Children’s Refuge, $100,000. Stunned silence, tears, hugs, laughter and beautiful heartfelt speeches. It has been a remarkable night. As I leave the building, blinking in the night, I feel enervated and energised. The next day I discover Sister Diana is right. It is an honour to fulfil my pledge.